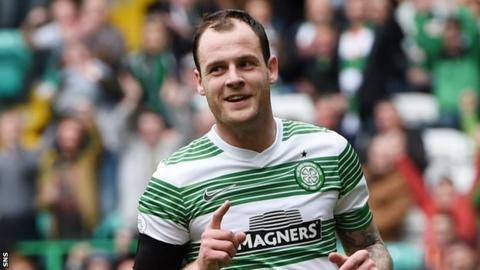 Celtic will investigate whether striker Anthony Stokes broke club rules during a recent visit to a Belfast bar. Assistant manager Johan Mjallby said: "We always deal with situations like this. It will be up to the manager and the club to sort that out. "Of course it is disappointing when small things like this happen. "But we need to look into it and hopefully make the right decision for the club and Stokes. We can't look after him 24/7." Dublin-born Stokes was disciplined by Celtic in 2012 when he attended a memorial event for murdered Real IRA member Alan Ryan. Following the latest newspaper report of Stokes joining singing in a Belfast bar, Mjallby urged the Ireland striker, who has been capped eight times by Republic of Ireland, to concentrate on his football. He said the 25-year-old "has been great for us this season and he is a very talented boy, a very good footballer". Stokes scored a hat-trick in last weekend's 6-0 defeat of Inverness Caledonian Thistle. "But obviously now and then he doesn't behave as well off the pitch as he does on it," added Mjallby. "First and foremost, the most important thing is to do the right thing on the pitch for the club. "But it is also important that they behave off the pitch as well and show they are great ambassadors for youngsters, so it is disappointing in that respect."